Islanders are encouraged to prepare for above-normal rainfall and possible flash flooding during the "wet season" that began last month and continues through April. The forecast comes from the National Oceanic and Atmospheric Administration's Climate Prediction Center. The advice is from Kevin Kodama, senior hydrologist in the National Weather Service's Hono- lulu Forecast Office. October and November are the worst months for storms, with an average of one to two floods, Kodama said Friday in a workshop on the rainy season. The state's dry season is from May through September and this year was drier than usual, he said, noting Kauai's Lihue Airport had the driest August, September and October on record. Easing the state's drought, a winter storm hit Oahu Nov. 4 with flooding, lightning, thunder and blackouts. Then it moved across the state. The wetter-than-usual months predicted through April are associated with a moderate La Nina that could become stronger and persist through spring, Kodama said. However, he said the relationship between a La Nina event and above-normal rainfall isn't as clear as the relationship between El Nino and drought. In 2000, he said, "A pretty strong La Nina occurred and we ended up staying dry." Cooler than normal water temperatures occur in the tropical Pacific with La Nina while warmer than usual waters characterize El Nino. Most direct weather-related deaths are caused by flash floods -- rapidly rising water along low-lying urban areas or streams, Kodama said. People die trying to drive through fast-flowing water or from being swept into a rising stream while hiking, he said. "Two feet of water will carry away most vehicles. Six inches can sweep you off your feet." "Turn around. Don't drown," the weather service warns. 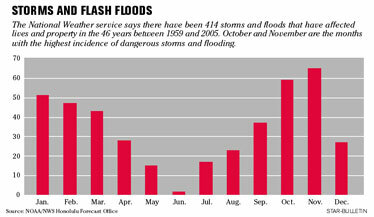 Records show 414 storms and floods with impact to life and property in the past 46 years through 2005, with an average of nine per year, Kodama said. He didn't include 2006 in the count because "it was off the chart," he said. Residents endured 1 1/2 months of record-breaking rains from February to April 2006 with 28 flood events and $50 million in damage, he said, reviewing the weather disaster. The Ka Loko Dam breached March 14 last year on Kauai, killing seven people. Four tornadoes with hail and waterspouts also occurred. April 2006 was the wettest month ever at Lihue Airport with 36.13 inches of rain, Kodama said. Although last year's long period of severe weather was "highly unusual," it happened in 1951 and "probably will happen again," he said. The 2006 event was the state's worst bout of bad weather since the October 2004 rainstorm that dumped 8.70 inches of water in five hours on Manoa Valley, he said. It caused about $100 million in damage, mostly to the University of Hawaii, he said.